I love reading and I love hearing about or reading about people and reading. Lately I've been curious about successful people who are readers. 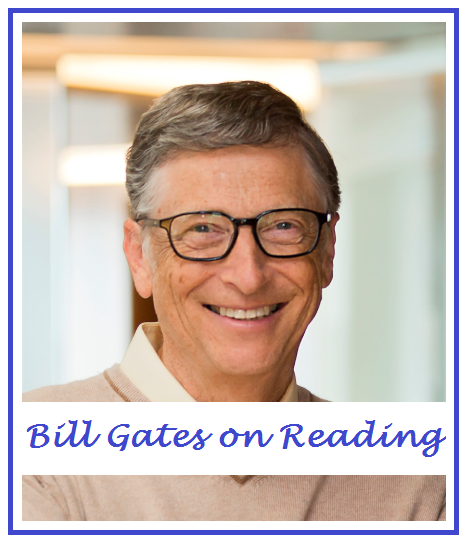 Today I'm sharing Bill Gates on reading. Enjoy! Bill Gates and his tote bag of reading material--it makes me happy that this tech giant loves good, old fashioned regular books, not e-readers. This whole video is great--from an interview with Charlie Rose--but if you only want the bookish parts, skip ahead to 6:18 to start with Gates talking about Leonardo Da Vinci's notebooks which Gates bought at auction. Or, skip ahead to 7:51 to learn about Gates's reading bag. I guess Gates is a speed reader. I can speed read, but I really prefer to slow read--there's an entire book club in Notting Hill, London, England dedicated to slow reading and I hope someday to join them! All of these appeal to me, but I really would like to read Hyperbole and a Half as well as The Magic of Reality. I'll definitely be putting them on my library list--although I linked these books to Amazon, I encourage you to check out your local library. Libraries add huge value to communities but they can't survive without patrons. Plus, if you are good about returning your books, videos, and other items on time, it can also be a money saver. You can find the books section of Gates Notes HERE. HERE's an interesting article about Gates and his reading habits and an annual "vacation" of sorts. The article says Gates reads up to 15 hours per DAY during his vacation-like retreat! Although other aspects of the retreat sound miserable to me, the tremendous amount of reading sounds AMAZING! THIS article isn't solely about Gates, but it does start off with a quote from his dad about Gates's childhood reading habits. ***Please note, many links in this post are to Amazon Affiliate listings. I may earn a teeny commission if you make a purchase through these links. but mostly I just want to spread the book love. Thank you. 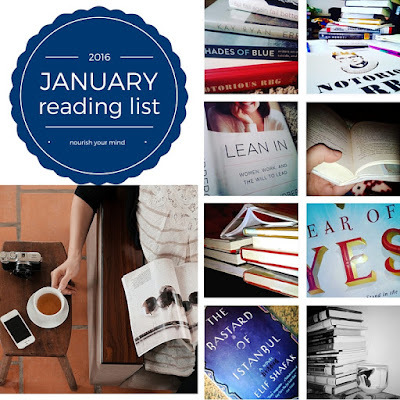 I realized recently that I didn't read nearly as much as I had thought in 2015. It was a little depressing, but it also made some of my dissatisfaction with 2015 make more sense. Last year wasn't great--it actually really sucked in many ways, and I really think not reading as much as I would like had a big impact on the year. So, one of my 2016 goals is to read more. A LOT MORE. Reading simply makes me--and keeps me--happy. It keeps me engaged and it keeps me going. 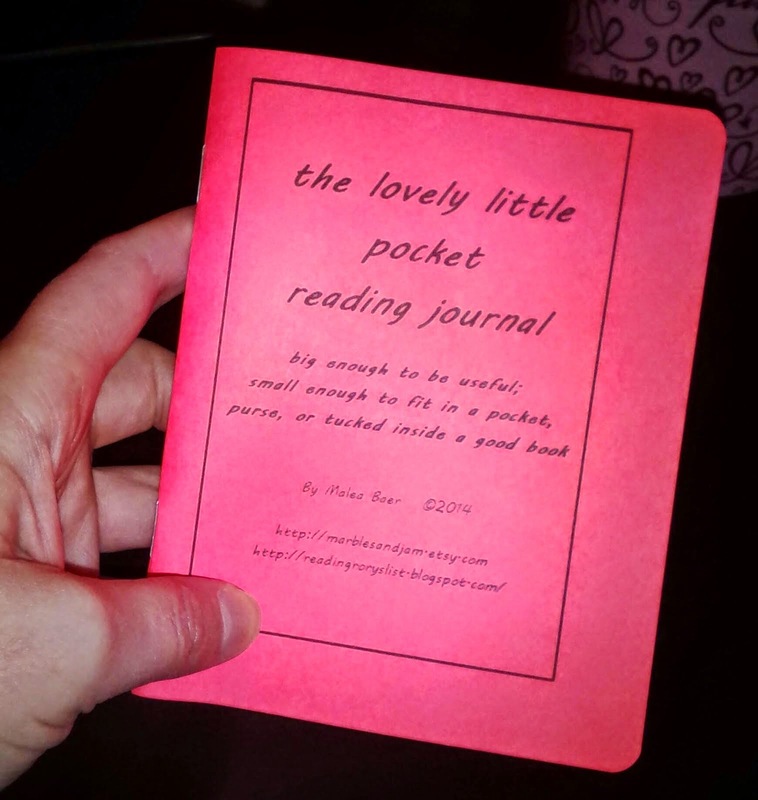 I started tracking my reading a long while ago after reading Nick Hornby's The Polysyllabic Spree (read about it HERE) and then after being coming across the Rory Gilmore Reading List (the inspiration for this blog--find it HERE), but I haven't really tracked my reading much in a while. It's time to get back to it! Last month I was doing a lot of tutoring at my local library and started picking up books every time I was there. It was one of the best decisions I made last month! I've continued using my library this month even though I haven't done any tutoring in the last few weeks. The library is close and easy to stop by before or after other errands. I then decided to start tracking my reading again after coming across bookish posts from two of my favorite creative and business inspirations, Michelle Ward of When I Grow Up Coach and Leonie Dawson from the Shining Biz + Life Academy, they both posted on Facebook asking for book recommendations (in closed/private groups/pages so I can't link to the discussions...sorry!). Lean In by Sheryl Sandberg--LOVED LOVED LOVED IT! Notorious RBG by Irin Carmon and Shana Knizhnik ONE OF THE BEST BOOKS I HAVE EVER READ! I highly recommend reading this alongside Lean-In! So, what are you reading? 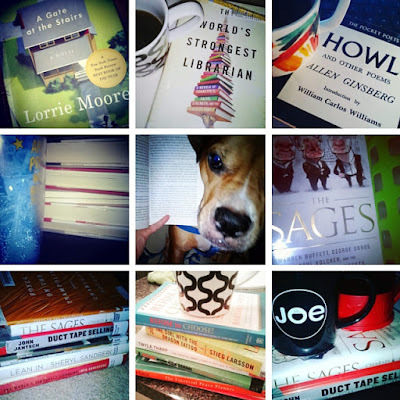 What have you read that you loved? What have you read that you hated? Are you on Instagram? We are ~ find us HERE. Find our other Instgram blog posts HERE. Follow us on Instgram HERE. Find our Etsy shop HERE. I've been spending a lot of time at our local library lately, in part due to increased tutoring requests and the ease of meeting students there and in part due to a re-commitment to frugality and voluntary simplicity in an effort to pay down debt and increase savings. 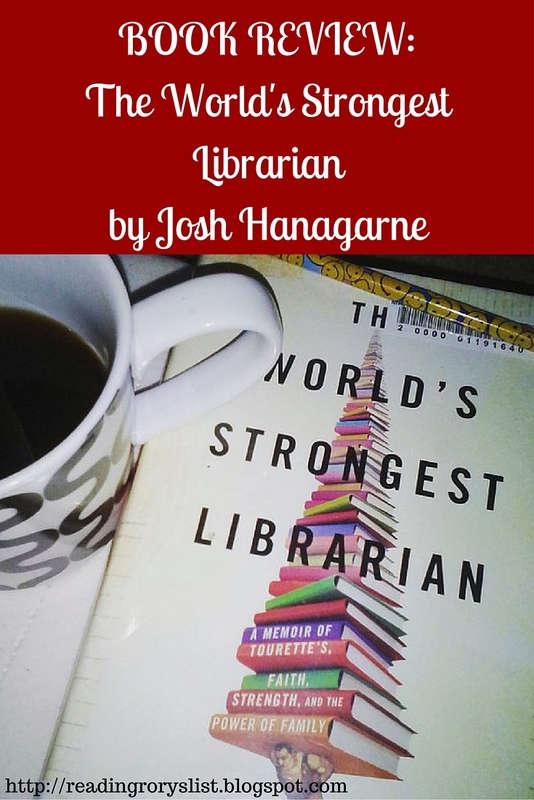 As I was wandering the stacks recently, I came across an intriguing title: The World's Strongest Librarian. I actually read the title on the spine, thought, "Huh, interesting...." and kept walking. I came back and looked at it two or three more times before finally taking the book off the shelf. I'm glad I went back. While I didn't LOVE every part of this book, I loved enough of it to recommend it. The subtitle pretty much sums up the book -- "A memoir of Tourette's, faith, strength, and the power of family." While the book is all of those things, and at times can feel a bit sappy, it is also quirky, fun, and enlightening. I'm slightly familiar with Tourette's and have known many Mormons, but this book gave good insight into both while also telling a charming, heart warming story of a young man coming to terms with having an, at times, debilitating condition, and the unique ways (they have to do with weight lifting!) he found to deal with it. The author, Josh Hanagarne, is also honest in a refreshing way about his struggles with his faith over the years -- something I think many people can relate to regardless of their religion. And, although I've known many Mormons, I realized in reading this memoir that I know very little about how Mormons practice their religion. It was interesting to read both Hanagarne's descriptions of his religion as well as how he began to stray from his faith and the unexpected way he seems to have reconnected with it. Hanagarne is an actual librarian and what probably got me to bring this book home is his absolute love of books and reading. It is evident throughout the entire memoir and gave me an immediate connection to Hanagarne. I love books about books or about people who love books. Hanagarne tells some sweet, interesting, and at times downright weird stories from his experiences with books and in particular from his experiences as a librarian. Having spent time in New York City libraries and also through working in emergency medicine, I frequently found myself not only smiling and/or sympathizing, but also nodding my head and thinking, "Oh, yes! I know exactly what you are talking about, Josh!" I probably won't buy this memoir or reread it, but I did enjoy it and think you might too. Or, try your local library. in a small commission for me. However, any such commissions are greatly appreciated. All opinions expressed here and anywhere else on my blog are 100% my own. Do you have favorite childhood books? Those books that you just loved to read over and over or books that you think of fondly when you consider your early reading experiences? For me, Let's be Enemies written by Janice May Udry and illustrated by Maurice Sendak is just one such book. I adore this little treasure! 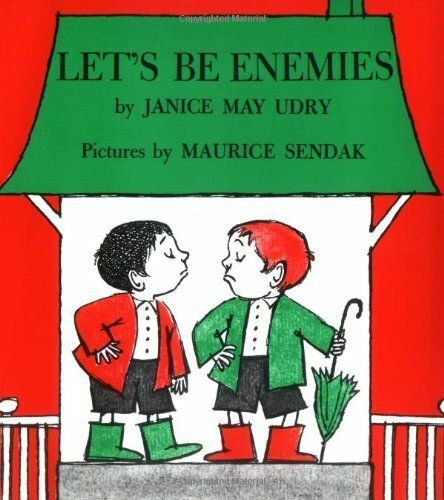 It's a great little story that perfectly tells the tale of friendship among children -- friends today, enemies tomorrow, and friends again the next day. It's about navigating me versus you versus both of us together. I also appreciate the simplicity of the tale and the pared down, simple style of Sendak's illustrations. 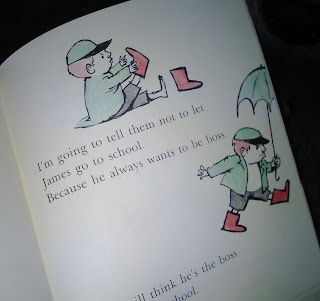 The simple story and the simple illustrations compliment one another perfectly. I love that this little book and Sendak's illustration style doesn't confine itself to the borders of the page. Sendak was never afraid of the action going off the page, much like Edgar Degas paintings where it often appears that something is happening just outside the frame of the image. 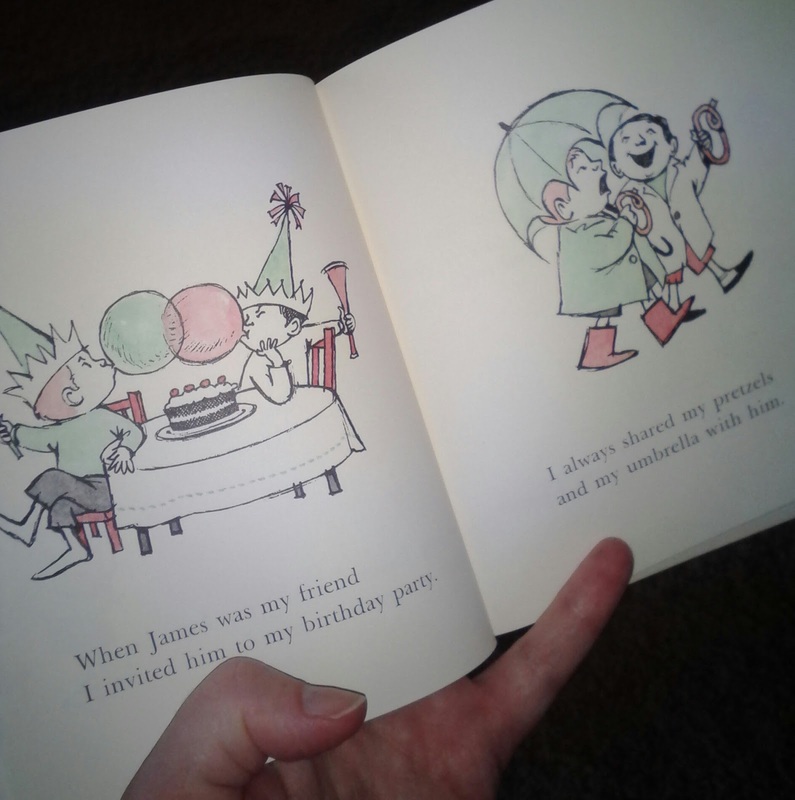 And, the images throughout the book are just plain adorable. 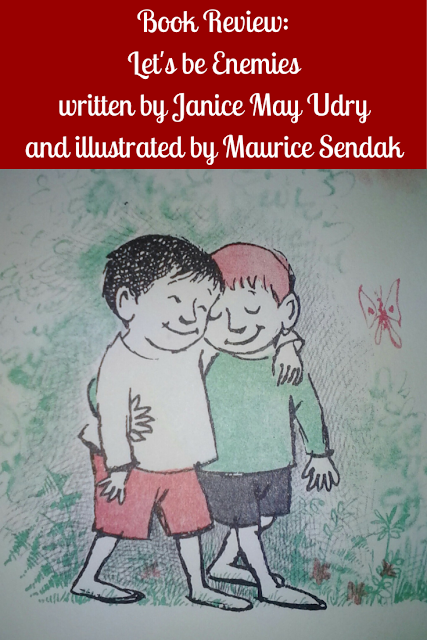 Sendak captures emotions and thoughts in the way he illustrates a face or the position of arms or legs. He creates whole characters in each illustration. 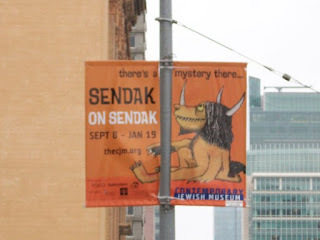 I love Maurice Sendak so much that when an exhibit of his work came to the Contemporary Jewish Museum in San Francisco several years ago, my son and I jumped at the chance to go! 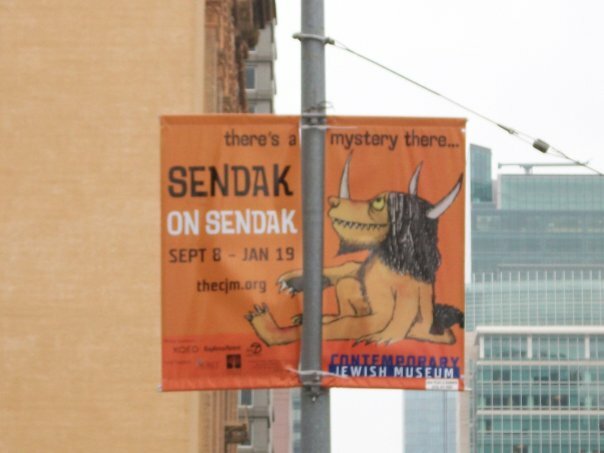 Cameras were not allowed in the exhibit so I don't have pictures, but if you ever have the chance to see Sendak's work, please do go. Do you have a favorite Maurice Sendak book or illustration? Please share with a comment! I adore this book. 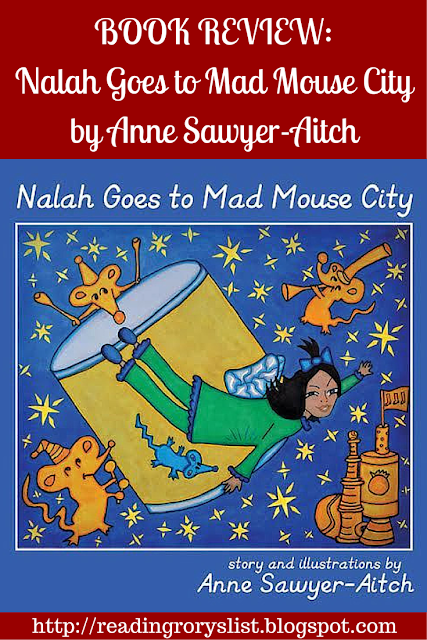 Nalah Goes to Mad Mouse City by Anne Sawyer-Aitch is a terrific little romp of imagination and fun. But, more than that, this book is simply gorgeous. It works beautifully as a story to read with children, but it also makes a wonderful picture book. Nalah Goes to Mad Mouse City is the second in a series by Sawyer-Aitch, following young Nalah through adventures galore. In this book, Nalah is upset because most of her imaginary friends have gone on vacation leaving her seemingly alone. Of course, her family is still around, but they are all too busy preparing for a big family picnic to pay attention to Nalah. However, not all of the imaginary friends turn out to be gone! Mad Tooth, a mouse who loves to chew on Nalah's socks (but only one sock from each pair), is still around. Mad Tooth finds out that Nalah is sad and missing her friends and decides to take Nalah on a wild adventure through the sock drawer and into a mouse metropolis. 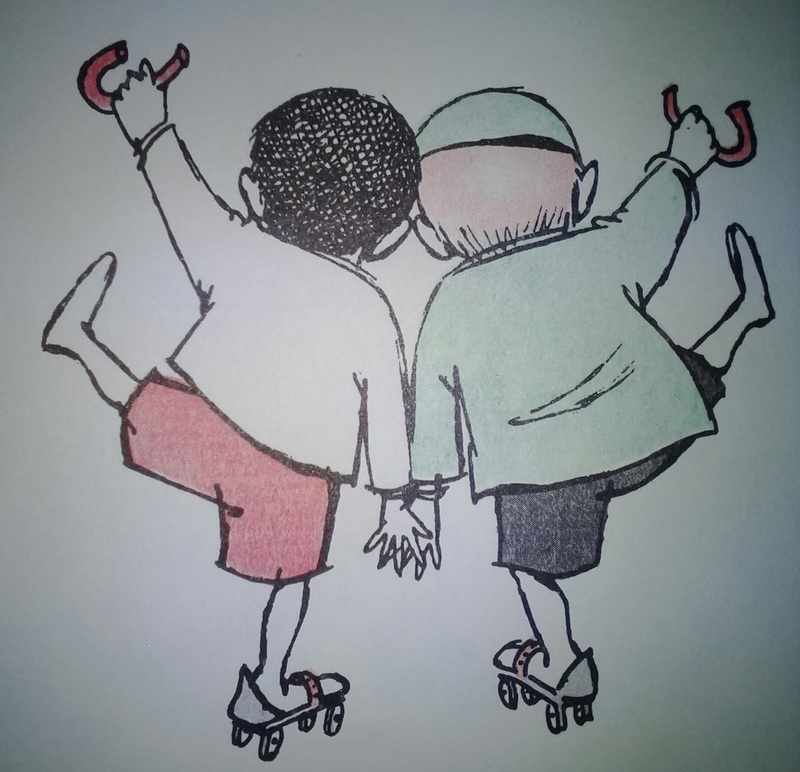 The fun that ensues is filled with lively play, dancing, new friends, taffy, and a sock monster. The story itself is sweet, especially for this mama reviewer who had (has) an active imagination. 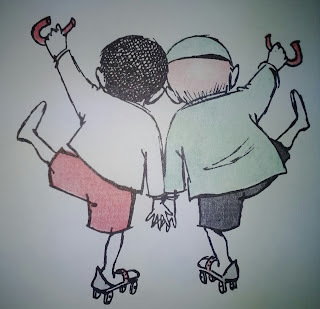 As a child, I had an imaginary friend named Danny, and until my sister was old enough to talk and play with me, Danny was my constant companion. This book helped rekindle memories of Danny and my wild childhood imagination. I loved it! The adventures of Nalah and her imaginary friends are sweet enough, but what I truly loved about this book is the illustration. I can't think of better words to describe the pictures that fill every page. Sawyer-Aitch describes her process as illuminated illustration which brings to mind illuminated manuscripts from the Middle Ages. Although the overall style of Sawyer-Aitch's illustrations are quite different from those of the monks and others that perfected illumination techniques all those centuries ago, there are many similarities. The illustrations cover the page in full, glorious color and involve multiple steps to create the final product. 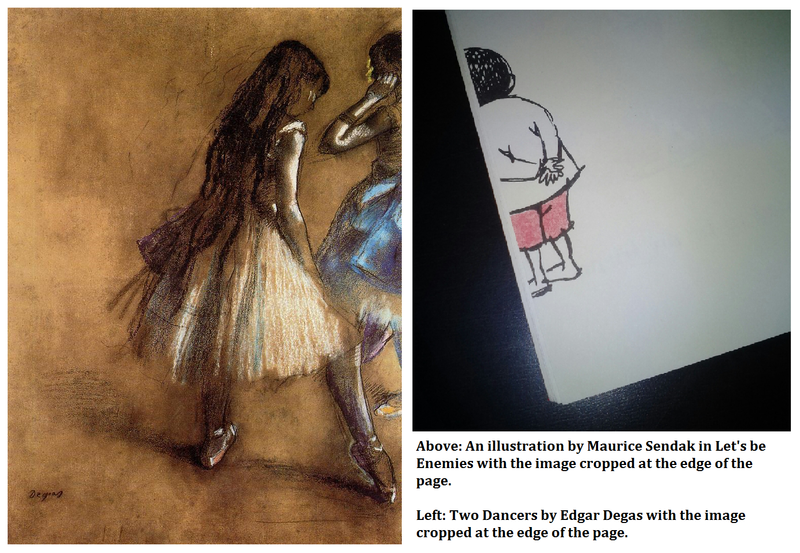 Sawyer-Aitch's process, as described at the end of Nalah Goes to Mad Mouse City, involves two pencil drawings or each illustration, coloring them in, cutting away key pieces, and layering the two over a lit surface. The result is full of bright, colorful movement and emotion. It is a technique I plan to try in my own art soon. 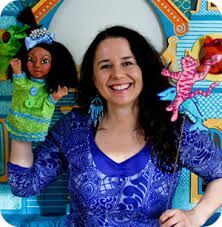 At the start of the book, Nalah's imaginary friends are going on vacation to various places around the world. They specifically mention Australia and France. Find each place on a map or globe. Consider calculating the distance from your own home. How would you get there? What would you do there? What do you think each of Nalah's friends are doing there? Use the story to discuss emotions -- Why is Nalah sad at the start of the book? What other emotions does she feel throughout? How do the other people and characters in the book feel? What do you do when you have those emotions? Ask, "What would you do in each situation presented in the story?" Try the illustration technique described at the end of the book -- this would be a great art activity for older kids, even teens. ***This post and others on this site may include affiliate links. memoirs are among my favorite of all genres. 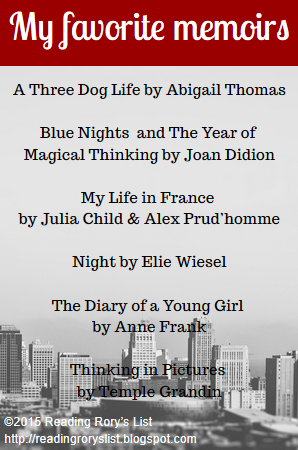 Of the ones above, I can't choose a single favorite, although I do most identify with Joan Didion and Abigail Thomas in part because we are living in the same time, although they are both quite a bit older. I also identify with Temple Grandin as, although I don't have autism, I do often think visually. It's automatic and from talking to others, apparently it isn't normal...? Elie Wiesel ~ how does one become so eloquent in the face of such experiences? Anne Frank ~ her sweetness, compassion, love for others mixed with her normal, everyday girlness are wonderful despite what ultimately happened to her. And, as for Julia Child and Alex Prod'homme, well, I love to cook and I would love to try life in another country. My Life in France is just plain interesting and at times fun. Need to relax and unwind, but not in the mood for a good book? 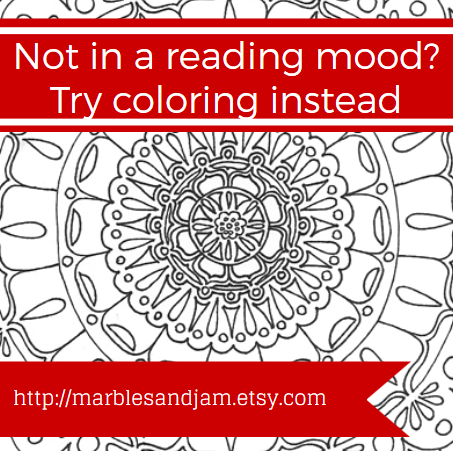 Consider coloring . 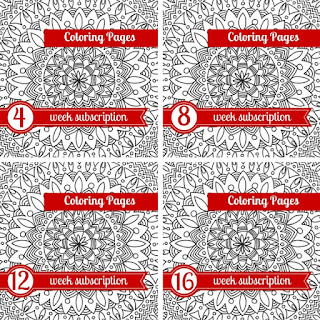 Psychoanalyst Carl Jung prescribed coloring to many of his patients to overcome stress, anxiety, and issues with focus. 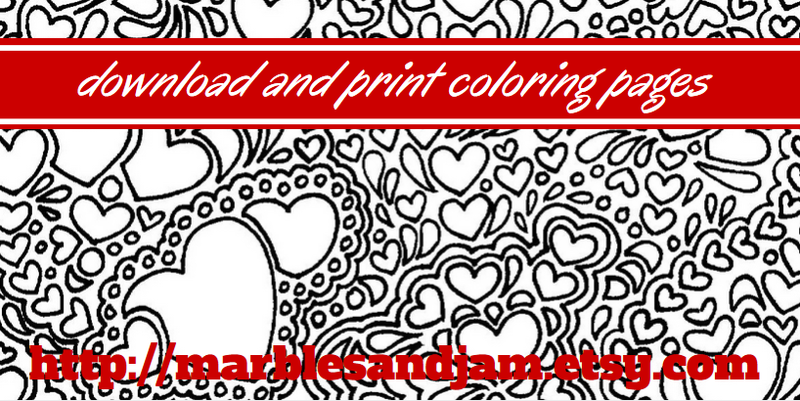 Check out my coloring pages and more on Etsy HERE.